Personalised Swim Shorts. Make Your Own Swim Shorts. Personalised swim shorts are a great way to stand out from the crowd. Whether you're at the beach or the pool, be unique with these photo swim shorts made from Breathable Waterproof fabric, with mesh net briefs on the inside. Design your own swim shorts online, the elasticated waistband and drawstring ensure a great fit. Take to the seas with your own unique style by donning a pair of personalised swim shorts. 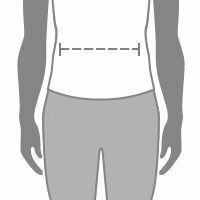 Make your own swim shorts in a wide range of sizes from 2XS to 4XL plus size. With an elasticated waistband, functional drawstring and side seam pockets, these swim shorts are made from a breathable, waterproof fabric, with mesh net briefs lining the inside. Choose between a black or a white trim option, which will change the colour of the stitching and the drawstring, and customise with your photos. You can even add text to your design. Fast service. Great quality product. So impressed with the finished product of our board shorts. The process of creating the design was easy and the service standard was outstanding. Deliver to Australia was quick and easy. Would definitely recommend Bags of Love. Your photo, collage, and designs are printed directly onto the breathable waterproof fabric. This is a poly fabric that has a PU coating on one side which makes it resistant to water and wetting. It is also extremely quick-drying as well as being very breathable. This means that while it stops the water getting in, it also allows perspiration to evaporate as well as keeps you cool. Your personalised swim shorts are printed edge to edge using eco-friendly inks, and our superior printing methods bonds the inks deep into the fibres of the fabric. If cared for correctly, your prints should last a lifetime. 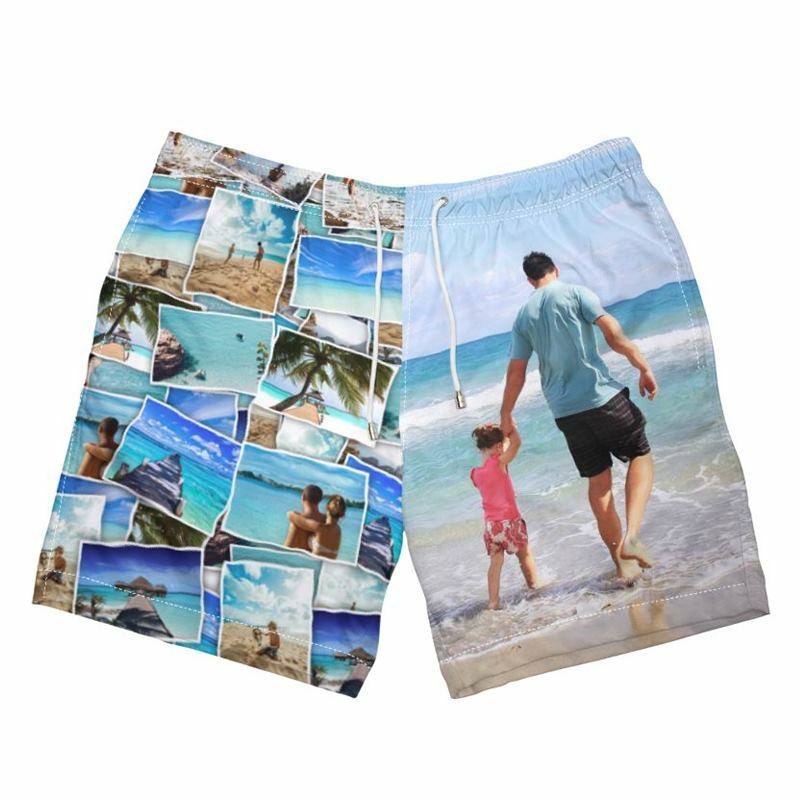 When your printed photo swim shorts fabric is ready, we will cut the material to the correct size and shape, and expertly sew together your finished personalised swim shorts. Your men's swimwear shorts will be taken to our quality department, who make sure everything is just right before it goes to shipping to be sent off to you. All this is done with a great turnaround in our Bags of Love studios. When you make your own men's printed swim shorts with our online design tool, you can choose not only the size, which ranges from 2XS to 4XL, but also the trim colour. With a choice of black and white, this feature changes the colour of the stitching thread and the drawstring. It also changes the colour of the metal eyelets that the drawstring protrudes from, a silver colour with the white option and with the black, gun metal colour. There are so many amazing things that you can do when you make your own swim shorts, but as you can design the front and back of each the right and left leg separately, we really love the idea of contrast or complement. Use a photo on one side and then choose a colour which matches the design to have a bold block of on the other leg. You could also use a completely contrasting colour rather than a complementary one to really make your personalised men's printed swim shorts eye catching. Another design we love is to have one enlarged photo on the one side, and then a photo collage on the other. This is a whole new unique take on the contrast or complement design but it works really well. Cut & sew personalised trunks designed to showcase your photos, logos, and text. Choose from two stunning Lycras in sizes XS – 4XL.